ATTENTION: DO NOT INSTALL UNLESS ABSOLUTELY SURE! Dadabuntu follows the route laid down by Hugo Ball, Tristan Tzara, Johannes Baadel, Marcel Duchamp and others involved into anti-art, anti-bourgeois and otherwise anarchistic movement of Dadaism. 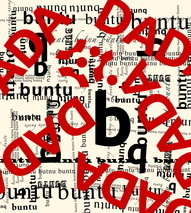 Dadabuntu is an anti-OS OS – by all means, it liberates its user from the burden of modern-life computing. Dadabuntu provides an ultimate data abstraction concluded in the absence of any data. It is an abstraction superior to any other possible abstraction. Dadabuntu removes meaningless and ridicules any information that is not a boolean zero. The new surface provided by a ground zero is the ultimate beginning of true data. Once the installation process has begun it won’t end until Dadabuntu had completely wiped out any information stored in the computer. It fills any writable medium found to be attached with zeros – hard disks, USB-sticks, RW-CD/DVD/BR, ZIP-disks, magnetic disks or tapes and even reusable punch-cards – all storage mediums will be reset to their once original factory state of an absolute zero. Dadabuntu is very useful if you would like to sell an old computer or hard disk without risking your privacy and exposure of personal data. Once installed, Dadabuntu removes any information including all personal traces ever contained on a storage medium.